Published by Harvest Exchange Traded Funds. Quality is what thrives in good times and bad. When it comes to investments some of the things that indicate quality are established businesses with industry dominance, a history of rising profits and dividends that have grown over time. Stryker Corp. (NYSE: SYK), a leader in the global medical device industry and is an example of that. The company was founded in Michigan in 1941 by Dr. Homer Stryker who believed his patients needed better medical devices to improve their lives. Almost 80 years later, the company has three main products lines. The Orthopedics segment provides hip and knee implants. MedSurg offers surgical equipment, including surgical navigation systems, emergency medical equipment, and intensive care disposable products. The Neurotechnology and Spine segment provides products for brain and skull surgery, synthetic bone grafts and spinal implants. Stryker has a market capitalization of US $65.5 billion, had sales of $US 12.4 billion in 2017 and employs more than 33,000 people. It continues to benefit from global trends in aging and the development of emerging market healthcare systems. Both are increasing demand for its products. Stryker delivered another strong quarter in the three months ended Sept. 30, with all divisions delivering high levels of organic growth. This year it raised its dividend by 11% which is the 25th consecutive year of a dividend increase. On October 25, Stryker reported its third quarter financial results. The company earned $1.69 per share which topped estimates and was 11% better than the same quarter in 2017. Revenue grew 7.6% to $3.24 billion with all business units reporting higher sales. 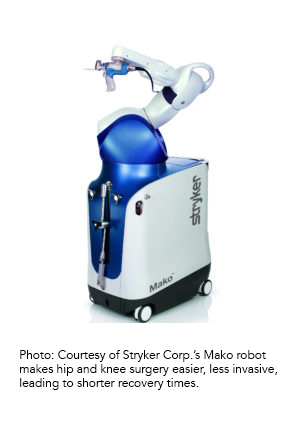 One growing area for Stryker is the use of its robots in knee surgery. Studies have shown that the use of robots improves surgical precision, decreases pain and speeds up recovery time. The company has installed nearly six hundred robots worldwide and has provided training for 1,350 surgeons. The unit reportedly cost $1 million each. For more on Harvest Portfolio Group ETFs click here.